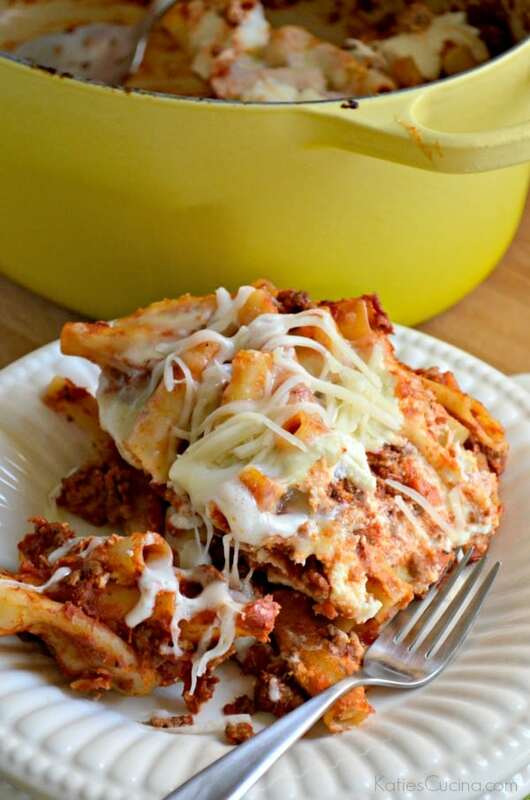 Take the meaty-cheesy classic baked ziti and cook it in just one pot! Same great taste and just one pot to clean up after dinner! Since it’s my husband’s birthday today I figured I would share another recipe that he loves. Get ready for another one pot pasta wonder! 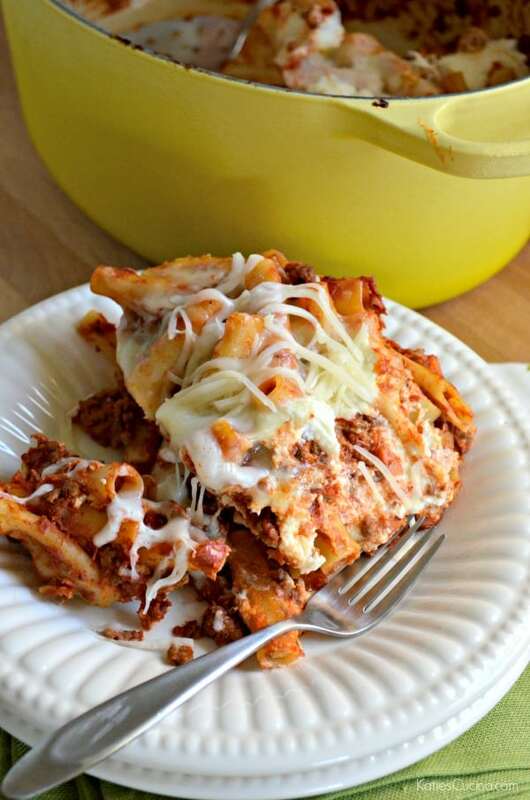 My husband and I grew up eating baked ziti on a bi-weekly basis. It’s a go-to recipe for both of our moms (and still is). It’s a classic. I decided to turn the classic baked ziti into a one-pot meal. Don’t worry—it still gets baked in the oven, but with half the dishes required to make this classic. 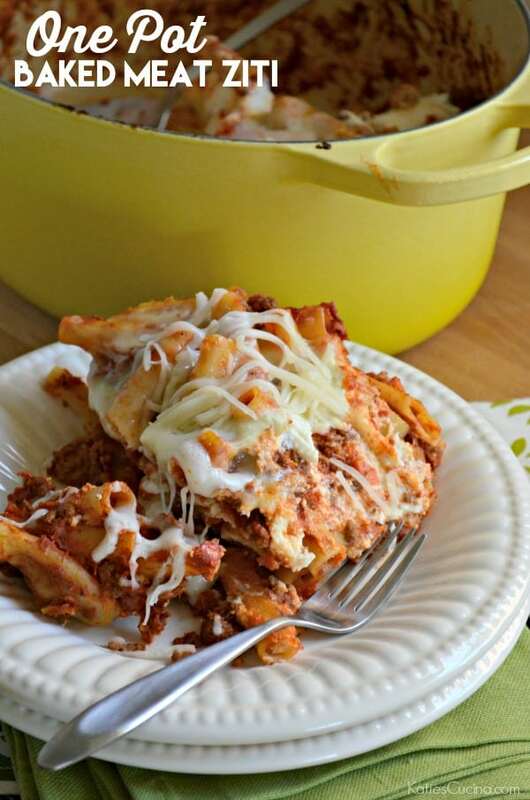 You’ll want a heavy-duty stove-top and oven safe pot to make this one pot baked meat ziti. You’ll cook most of this recipe on the stovetop and just finish the ziti in the oven under the broiler for a few minutes until golden brown. Like I said, half the mess to clean up. You’ll brown your veggies and meat in the pot first, followed by adding in a box of pasta, pouring the crushed tomatoes on top, mix it well and let it cook for a good 20 minutes. Don’t forget to stir it a few times while it’s cooking. Once the pasta is al dente (or to your liking) you’ll remove it from the heat and place dollops of ricotta throughout the pasta. Top it with shredded mozzarella cheese and place it under the broiler. That’s it! One pot… not 3 or 4! While the pasta cooks, it gives you time to unload the dish washer, make a salad, and toast some garlic bread to go along with your dinner! This classic can also feed an army and I find its perfect for entertaining. Even better since you’ll have fewer dishes to do once your guest leave! 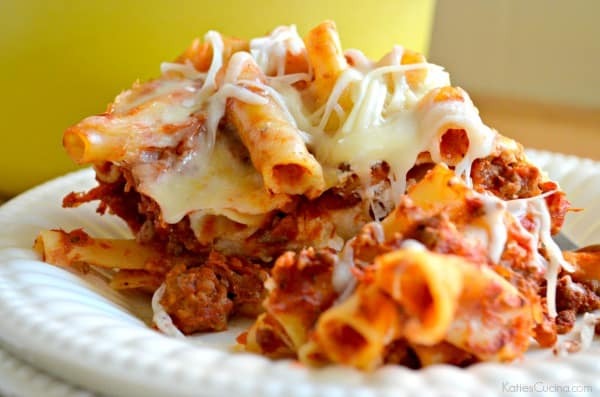 Or, make a big batch, split the ziti in half, and bring it to a friend or family! Going into the rotation. They’ll love this! Thanks for another easy and perfect recipe! Your so welcome! This is an easy one for sure and one pot! You can’t beat it!! !